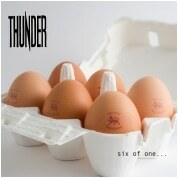 The brand new Thunder EP ‘Six Of One…’ is released on Monday 8th October 2007! You can pre-order your copy NOW!! Produced by Luke, with Ben engineering and mixing it all, the EP features 3 brand spanking new and therefore previously unreleased songs, along with 3 tracks recorded live at The Glasgow Academy during last November’s tour. ‘Six Of One…’ will be a limited edition release, with only 3000 copies being manufactured and will be available EXCLUSIVELY through Townsend Records – you won’t find this one in your local record shop! So get your order in now!! If you’re eggcited or just plain curious feel free to click here for a sneaky advance listen. Enter our exclusive ‘Six of One…’ competition! Click here for details!